"Why Greece?" was the question Zen asked me. All I could think of was the night we went to watch that Mamma Mia movie that was based on the actual Broadway play. Zen and I had been dating for six months and were getting very exclusive. I thought those first few months were a dream. Having that special someone I had been waiting for, for quite a while, actually show up in my life and take permanent residence in it, was so surreal. Or so I thought. How I was wrong. We sat next to each other, and I guess I sang along to most of it. I wasn&apos;t ashamed really, I was happy and silly, by then Zen had known all my quirks hence there would be no point in hiding them. Occasionally I would look at Zen and smile, or laugh, or point out some form of irony. He would just smile politely and turn to continue the movie. How absorbed he was with that movie! I was with him, in a movie theatre, alone, and he wanted to know whether Pierce Brosnen and Meryl Streep would actually hook up in the end. It had taken Zen three months to hold my hand, six to actually kiss me, on my cheek for that matter. Both events he had requested permission. Both times I was impressed, taken aback by his gentleman-y ways, how sensitive and considerate he was to ask whether or not he could invade my personal space. I would giggle nervously and grant him permission. Then one night I returned home and watched one of Clark Gabel&apos;s movies. He was holding one of his costars-the main character maybe-he shaking her desperately demanding being loved, and he kissed her. This passionate earth-shattering kiss. Without taking permission. She was resisting -apparently she was mad- then as if she was a chocolate bar on a hot August day, she melted gradually into his arms, embracing him. I watched enthralled with this scene. So curious, how primal and animalistic of him to seem so territorial! Then I suddenly realized, I wanted that, badly. I wanted someone (Zen) to shake me this violently and kiss me that violently, as if his own life depended on it. I always had my reservations, but with Zen it is if they vanished and I am forever expecting him to do something, anything! He never did. He remained polite and considerate till the day I left him. I guess that was part, or a percentage, regarding leaving him. He would never be spontaneous. Settling. The word I feared at the fragile age of 17. I was morphing into the version I feared. The settler. The wife. The mother. The grandmother. The deceased. That was the pathway I was on. He looked bewildered, "Where Jillian?" and gave me a confused smile. "Santorini! It would be the perfect getaway! Just you and me and the crystal blue sea! Ha-ha even rhymes!" I giggled and laughed while holding his hand in a casual-we-always-do-this- manner. So gullied and naïve. So in love with this person actually poring myself. What man would resist a getaway with his girlfriend!? "Santorini? Now? We have finals and after a month both of us need to start internships, remember?" He made so much sense, so much sense that the in love version of myself, the lovey-dovey self, was very much discouraged. "Oh you&apos;re right. How silly of me!" I agreed. At that time he was right. But that&apos;s the point of being spontaneous: not listening to common sense, simply being. "It&apos;s time to board the plane Jillian." Cecilia said while grabbing her bag pack and holding her boarding pass. I nodded and followed her to the gate. We boarded the plane, placed our bag packs in the compartments above our seats, sat in our respected seats, then heard the pilot greeting us aboard and announcing we were about to lift off or something like that. The stewardess was pushing a crate along the aisle distributing drinks, and when she got to our seats I ordered coffee while Cecilia ordered whiskey (her new form of therapy as she puts it), "Coffee doesn&apos;t cut it anymore, this is stronger" she once put it after she ordered whiskey after dinner one time. "The inflight movie for today is Mamma Mia" she said with a slight accent and a simple smile. "Seriously?" I said with disbelief. "Yes ma&apos;am, to get you into the mood of Greece." Totally justifiable. Not a coincidence. At all. I watched the movie. Again. Yet this time I didn&apos;t recite the lyrics. Or giggle or smile or point forms of irony. I just stared at the screen. A different person watching the same movie. I poked holes in the movie making, the high pitched sounds, ridiculous dialogue, the so-so acting. I didn&apos;t watch it the same way as I did before. She turned and gave me the &apos;seriously?&apos; look. "Well I liked that movie &apos;the first wives&apos; &apos; club for Diane Keaton, Goldie Hun and Bet Midler, was one of my favorites after the divorce." she answered. She put her headphones on again and closed her eyes. I guess it meant something to her at the time. The thought of first wives plotting revenge against their ex-husbands, the righteous justice. I guess she felt she needed justice or something, like the universe should provide the identical plot to her situation. I guess she thought the universe owed her justice at that time. That it still does. I guess to me Mamma Mia, at that time, gave me prospects of love and happiness. That nothing would go wrong. 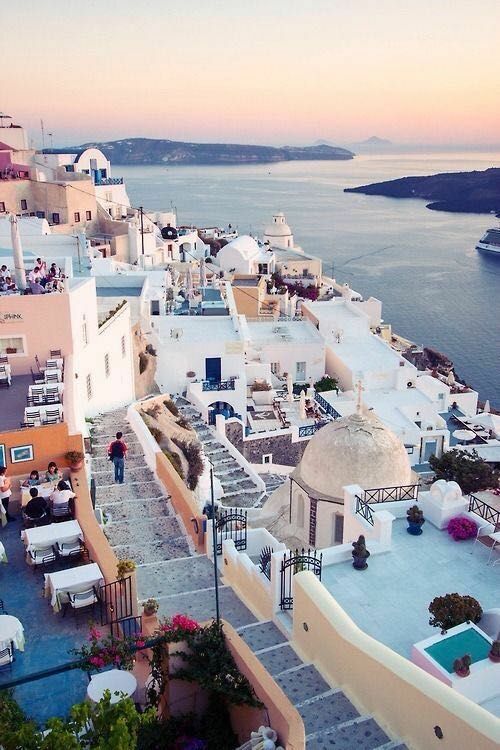 Like Santorini would always have blue skies and crystal blue water. Why was I going again?